When I read of the reported “PA-Hamas reconciliation” deal, my initial response was generally positive. It seemed to me that Palestinian leaders on both sides were finally taking their constituents’ desire for unified leadership seriously. It also appeared that – together with the PA’s campaign to find international support for a declaration of statehood – Palestinian leadership had decided to proactively shake up the paralyzed status quo. The United States supports Palestinian reconciliation on terms which promote the cause of peace. Hamas, however, is a terrorist organization which targets civilians. 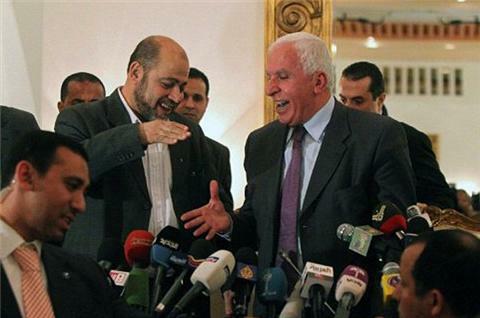 The agreement signed last night between Fatah and Hamas does not represent unity. The reconciliation agreement represents a move to appease growing popular movements on the streets of Gaza and the West Bank which are demanding real unity, one that might not even involve the PA and Hamas, in order to combat Israeli occupation. A unified Palestinian population in the West Bank and Gaza which adopts nonviolent resistance tactics has the potential to inflict incredible damage on the Israeli occupation. Actually, Israel does not have an effective strategy to combat Palestinian nonviolence and unity. Look at the amount of military resources Israel have used to crush small West Bank villages like Nabi Saleh, which embrace unity and nonviolence against occupation. This entry was posted in Israel, Nonviolence, Palestine, Peace Process on April 29, 2011 by Rabbi Brant Rosen. in thinking in the beginning i felt very conflicted about my feeling about Hamas.I have come to realize that without hamas involved in negotiations the peace process is doomed.they represent a part of the base of the Palestinian people and their voices must be heard.i appeal to the goverments involved to take this step although it might take longer a more just and lasting peace will be achieved. I think you are correct about what woud be the real gamechanger here. However, I do think that a unified PA government can take very effective action. 1. opening of the Egyptian border. 2. Solution to the question of political prisoners. 3. More than tacit recognition of Israel behind the green line. 4. A clause of dismantling the PA in a dignified manner if unification together with a declaration of independence does not lead to a viable state within a specified time limit. The ‘dignified manner’ of point 4 here is crucial, as it opens up for Hamas and Fatah politicians to gain credibility and legitimacy in leading the new revolt Joseph Dana speaks about. And my guess is that the politicians involved gamble that they are the better candidates for leading this new revolt, and that those they look upon as opponent will fail. The effect of this move will be most exciting, and I think it is a real gamechanger. I am also convinced that several European countries will go to great lengths to recognize the unity government as soon as possible, and doing their best to build pressure on the US to do the same. I’ll be excited to see which tactics they’ll use. I agree with Brant that the US should itself engage with Hamas and even more importantly pressure the Israeli administration to face reality on the ground as well ( i hope to elaborate on this with a post at Beyondzs with 24 hrs). But I do think this changes the game – the problem is that anyone who says they know how is fooling you. It does potentially strengthen the seriousness of the potential unilateral declaration of a Palestinian state in September. And that fact certainly puts additional urgency on the Israeli government to retain control of events by pushing a bilateral agreement.